ie6 « Mods and Tutorials for VldPersonals. Hire us to design your site. 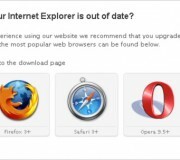 Browsing articles tagged with " ie6"
Stop using Microsoft’s IE6 web browser, says Microsoft and I agree we don´t need to support our site for ie6 anymore ! Now you can tell your members they had a very old webbrowser and need to update.